On a positive note the market ended July with 7.1% gains in the DOW. 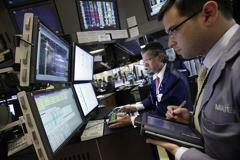 NEW YORK (AP) — Stocks had a fitting end to a choppy July as prices seesawed their way to a narrowly mixed finish. The market still had its best month in a year. Investors had an ambivalent response Friday to the government’s gross domestic product report, which showed that economic growth slowed in the April-June quarter. The Dow Jones industrial average fell almost 120 points in early trading, then ratcheted up and down until the close. The Dow ended down just a point, and the other big indexes had similarly small moves. The day was much like the rest of July, which saw investors alternately buying on strong earnings reports and selling on weak economic numbers. The Dow rose 7.1 percent for the month. The Dow and the Standard & Poor’s 500 index both had their best months since July 2009 and their first winning months since this past April. Hat Tip Yahoo Finance Check out more ..